A new report from the National Journal says that many Congressmen have adopted policies that keep them from being alone with their female staffers. The idea is to avoid the appearance of “impropriety,” but those female staffers told the Journal that the policies are hurting their professional advancement and their ability to do their jobs. One male Republican staffer said that when he worked in the House, one of his bosses declined to meet privately with female aides or have them staff him at evening events at the request of his wife, who thought it was unseemly. “There was never any doubt about the staffers and their behavior, or the member and [his] behavior,” the staffer said. But his boss’s wife worried what others would think, particularly back home in his Southern congressional district. As a result of the informal policy, the male staffer remembers being asked to accompany his boss to an evening reception with a group of defense contractors, even though he was much more junior than the female staffer who covered the issue. “I’d say, ‘she has more experience, this isn’t my area.’ They’d still say, ‘we need you to staff him tonight,’” he said. Another male aide who works for a Senate Republican said he was previously in an office where women weren’t allowed to drive the boss around or staff him at evening events. For his colleagues, it became clear that if they valued their careers, “they would have to go somewhere else at some point,” he said. 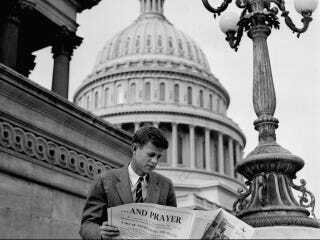 John F. Kennedy, then a Congressman, sitting on Capitol Hill in 1946. Image via AP.